Christening ceremonies for the Navy's new Military Sealift Command (MSC) ship took place 15 March 1997 at Avondale Shipyards in New Orleans. The ship was named Bob Hope (T-AKR 300) in honor of the veteran entertainer's decades of devoted service to US military men and women around the world. 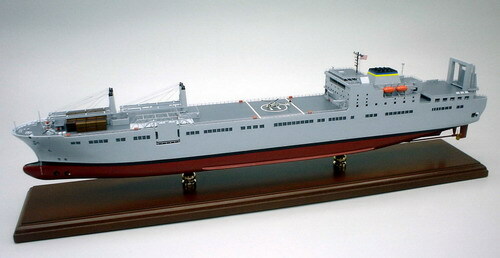 Bob Hope is the first of 14 large, medium-speed, roll-on, roll-off ships constructed from the keel up for the Military Sealift Command. Bob Hope joined MSC's Afloat Pre-positioning Force in 1998. Mahogany Wood. Length 33 inches.